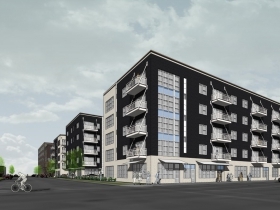 W. Washington Ave. NLE apartment building rendering done by Kindness Architecture. The most interesting real estate story of the past ten days takes us once again to Walker’s Point. 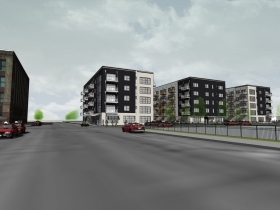 Sean Ryan of the Business Journal, reported on a $12.2 million apartment project that will be breaking ground in May. The project, designed by Kindness Architecture, consists of three five-story buildings with a total of 120 apartments. It is being developed by Tim Gokhman, of New Land Enterprises, Jim Wiechmann, of Wiechmann Enterprises of Milwaukee, and Michael Sanfelippo who owns the property. The property, which is located between S. 1st and S. 2nd streets, on the northside of W. Washington Ave., has for years served as a parking lot for Joe Sanfelippo Cabs Inc.
As Walker’s Point, and in particular the area along S. 2nd St. continues to develop there’s a backstory to this philosophy of walkability and reduction of the daily reliance on cars that evidently played a role in this development. In 2009, there was an effort to redesign the section of S. 2nd St. north of W. National Ave. into a complete street, which is a street designed to encourage pedestrian and bicyclist activity. The street was long overdue for a rebuild, riddled with potholes, and served as a shortcut more than a destination. At the time Juli Kaufmann led a group of business owners and residents in support of redesigning the street by removing a travel lane in each direction and adding wider sidewalks, street trees, and bike lanes to encourage more activity. Kaufmann found graphic artist Kieran Sweeney, who mocked up the design. 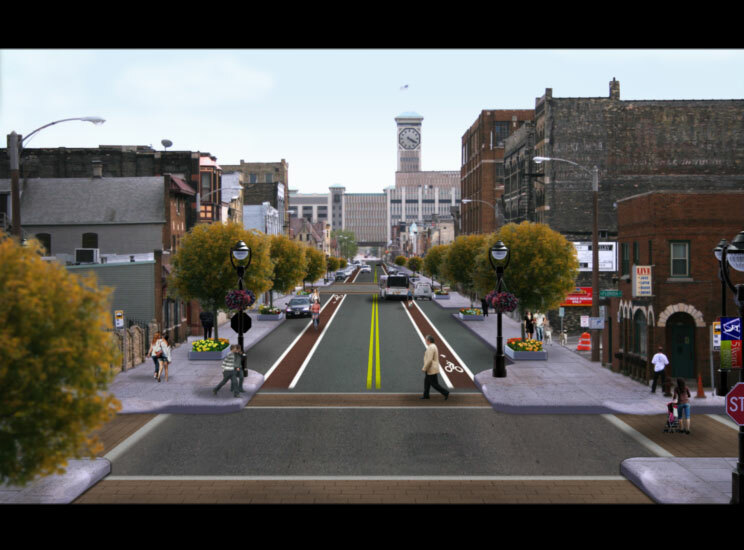 The designs were then entered it in GOOD magazine’s livable street contest. The design took second place in the competition, which was enough to catch the attention of other local media outlets and the Common Council which pushed the idea along. But that lawsuit never came and in May 2011 S. 2nd St. re-opened with the narrowed street design. Later the section south of W. National Ave. received new bike lanes and was re-striped to match the northern section. Following these changes, according to Ryan’s story, Sanfelippo’s Mobil station, at 605 S. 1st St., which according to Sanfelippo was going to struggle after the street was narrowed, has recently seen business go up about 20 percent. And Sanfelippo went on to tell Ryan, “I have seen a tremendous increase in foot traffic around here.” Go figure. But it doesn’t end there, oh no. Sanfelippo was also behind the effort to continue the city’s cap on the number of taxicabs allowed to operate in Milwaukee. For years he, with his brother Joe Sanfelippo, operated a near monopoly of the taxicab industry in Milwaukee, and were quite successful in this endeavor. But in July 2014, the city dropped the limit on the number of taxicabs that could legally operate in Milwaukee opening the market to entrepreneurs while legalizing ridesharing companies like Uber and Lfyt. In the end, businesses is up at the Mobil station, there are more transportation options than ever before in Milwaukee, and another surface parking lot is becoming housing. I’ll speculate here, but I don’t think the Common Council, which approved the complete street project on s. 2nd St., lifting of the taxicab cap, and the streetcar, could have asked for more. -My colleague, Michael Horne broke yesterday’s big development story, there’s now a plan to redevelop the Mackie Building and build a large building just to the south of it. -Signs at Juneau Village warn residents of an upcoming lobby remodeling, might they bring back the original marble interior? Doubtful. Fun Fact: According to a story by Dan Rafter, of REJournals.com, in 2014 McDonald’s had 14,350 restaurants in the United States. Sounds like a lot, but that’s nothing compared to the 48,500 self-storage facilities in the nation. This “ranks as the fastest-growing segment of the commercial real estate industry during the last 40 years,” the story tells us. And in case you missed it, we featured the 1800 E. North Ave. project in last week’s Friday Photos. I love this story. We should make complete streets part of the zoning code. Cars will always find their way…… cities are for people. And if we go back to designing cities for people, good things will continue to happen. I never understood why business owners think high speeds, one way streets and surface parking lots will draw customers. Why does Urban Milwaukee always feel the need to go on tangents that don’t relate to the story at hand? It doesn’t make sense that they always seem to portray business owners, developers, and people investing money into this city, as the “bad guys”. Always painting things in this city in a bad, negative light. Dave Reid, get a real job! I thought this piece was well done. A bit snarky towards Sanfelippo, but a review of the facts (backed with sources, no less) just reveals that his blustering was just that. Sure, he’s still trying to make a buck as he should and if cabs aren’t doing it, good for him that he’s using land for a development consistent with where the neighborhood should be / is going. Call it socialism if you will, but in this case, not giving any grease to the loudest squeaky wheel resulted in a better product for everyone. @Dave Reid great story. It’s great to get some follow through on the changes to S 2nd St.
You’ve gotta love this quote from Sanfelippo “The city killed the cab business and I don’t have too many cabs any more.” Sorry Mr. Sanfelippo but you are more responsible than the Common Council for killing the cab business in Milwaukee. If you made any effort to provide quality service in the many years your family had a near monopoly then the need for change wouldn’t have been so great. Since the cap was lifted, the qualify of cab service in this town had jumped greatly.